Part of the Vittoria restaurant group, Divino Enoteca is a great place for really good wine and a bowl of well-made gluten free pasta. Meeting a friend for an early midweek drink, we chose the more relaxed bar area rather than the restaurant. This worked well as you can enjoy drinks and snacks, but also choose food from the a la carte menu, should you want it. It was one of those evenings. We were going to have “a drink” but in the end we took the evening in our stride and enjoyed not quite too much delicious, crisp Austrian wine and a bowl of pasta with wild boar and pecorino. 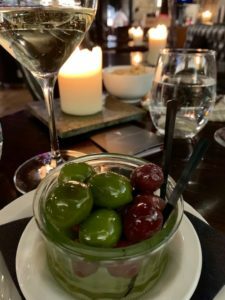 On arrival the server brought us snacks, but on my enquiry about gluten free they decided these were too risky for me, so brought a little round gluten free roll and then a bowl of gorgeously plump and shining olives – all with a great friendly smile. As the evening wore on and more food was needed, we studied the a la carte and I chose the pasta. But there is plenty of choice including pan fried fish and meat, vegetarian options and of course, a wide selection of pasta. As with most Italian restaurants, coeliacs are well catered for. My pasta was nicely al dente, very generous in its size and extremely tasty. The cheese was piled on the top and it was all piping hot – just perfect after a few glasses of wine! I like this place and have eaten in the restaurant a few times. The cooking is excellent, the service top notch and the wines are good too! They are known for offering good quality wine by the glass, using some clever vacuum technique for keeping it fresh – so if you only want a glass you will also be spoilt for choice. I have been to Divino Enoteca when the restaurant was heaving, but on our midweek evening in March it was just gently buzzing. A great evening all round and I went home with a contented smile on my face.